New in 2019 Indoor Splashplay Zone, Stunning Outdoor Sky Bar overlooking the Lakes and New Beach. 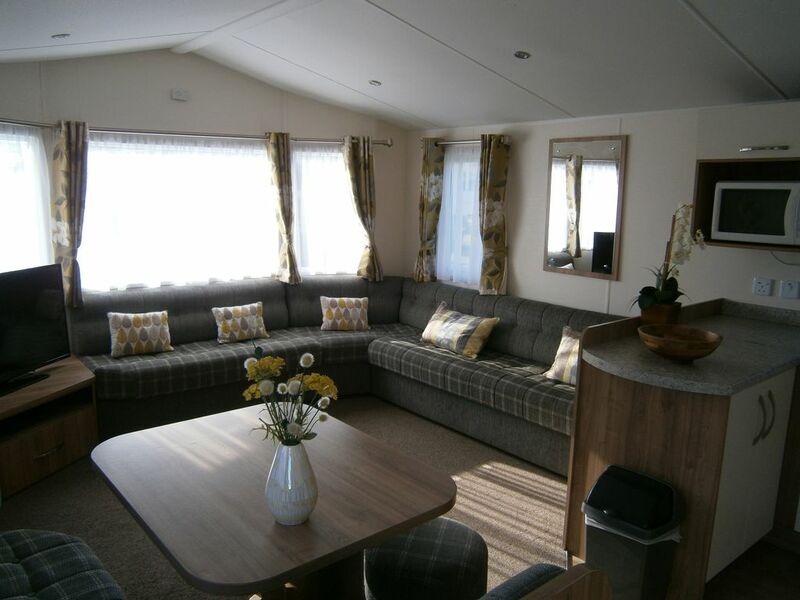 Set in the tranquil, picturesque countryside of Lincolnshire at stunning Tattershall Lakes Country Park we have pleasure in offering our luxurious 8 berth holiday home. Luxury shower room with W.C. & separate W.C.
For a small fee guests have access to the Merlin Entertainment Complex which has a heated indoor swimming pool with a new indoor Splashplay Zone and a new beach, a health spa, fitness suite, free Wi-Fi and a restaurant, an amusement arcade, the Spitfire Bar with regular staged live acts and a dance floor. Upstairs is the Propeller Bar and Restaurant with great views over the lakes. There is also a fantastic new outdoor Sky Bar with stunning views over the lakes. Tattershall Lakes Country Park is a stunning purpose built holiday park for safe family holidays including your pets. Situated amongst seven lakes where you can enjoy water skiing, jet skiing, an inflatable Aqua Park, cable wake boarding and fishing. You can hire a bike and explore the stunning views along the nature paths around the lakes. There are masses to do for the children - an outdoor Splash play area and a beach, a basketball court and 6-a-side football, outdoor adventure play areas, a mini-golf course, a giant ropes climbing adventure and endless organised activities. Outdoor bars and BBQs and a cinema under the stars!! There is a handy convenience store and fully equipped laundrette. Nearby is Tattershall Castle which is well worth a visit and the Battle of Britain Memorial Flight Visitor Centre at Coningsby where you can have a guided tour of the airplanes which flew in the Second World War. Only 20 miles away are the seaside resorts of Skegness and Mablethorpe and the beautiful scenery of the Lincolnshire Wolds including the Country Park at Snipe Dales with stunning walks. Just down the coast from Skegness is the beautiful landscape of Gibraltar Point Nature Reserve which has impressive views and wildlife. toilet, shower, With wash basin and mirror over. toilet, With washbasin and mirror over. Gas central heating throughout. Gas fire in living room. All bed linen is provided for the number of guests in your booking. Gas fire in living room. Free parking next to our holiday home. Free parking throughout the Park. We had 6 people and found the room plentiful. So much on the doorstep. Amazing treat of the fighter jets doing stunts outside and the kids were in awe. Great location. Everything required in the caravan even decent sized cooking utensils often not the case. Look forward to a return in warmer weather to make use of the lakes! Fantastic stay in great location. Only 20 miles away are the seaside resorts of Skegness and Mablethorpe and the beautiful scenery of the Lincolnshire Wolds.